DivaShop: End Counter Clutter & Tangled Cords! End Counter Clutter & Tangled Cords! Ladies, most of us love our styling tools don't we? Whether you curl, straighten, or blow out, a variety of looks can be achieved with various hair appliances. However, one thing we don't love is the mass of tangled cords & used up counter space. It was something we just had to put up with in order to use our beloved tools. 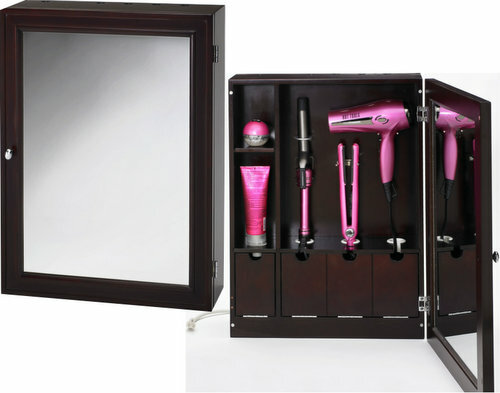 Behold, the Style & GoTM Hair Care Valet! This wall-mounted cabinet not only organizes your tools, but also allows you to plug in all your tools into it & then you use the cabinet's cord to plug into an outlet. Tools organized, cords corralled, & more counter space, how cool is that! This product was invented by Marcy McKenna, winner of the Homemade Millionaire competition. This product is what won her that competition & I can see why, it's a very clever idea.